No Human Resources Department? 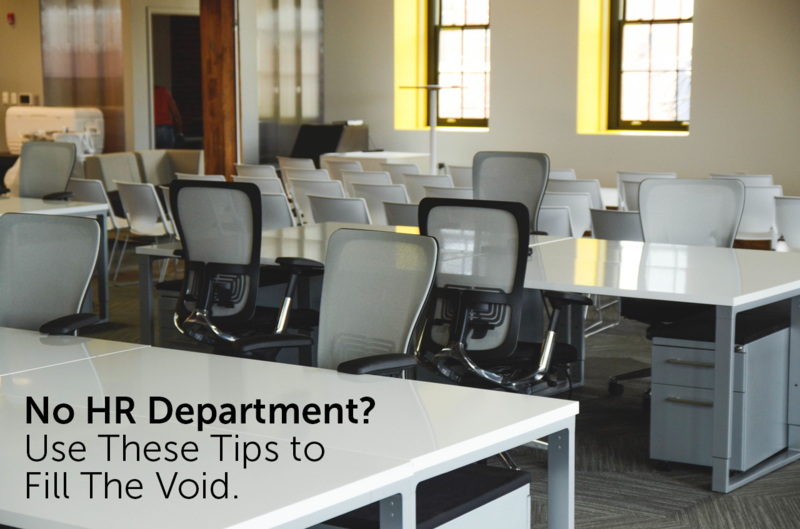 Use These Tips to Fill the Void. No HR Department? Use These Resources to Fill in The Gaps. When it’s comes to human resources, you have to tread lightly. There are plenty of missteps that can be taken (which can cost you and your business dearly). But with the right resources and tools at your disposal, HR can be an asset to your small business without taking too much of your precious time. Here are a few online tools to take the pain out of human resources, recruiting sites and suggestions to make hiring a breeze and online resources to keep your small business up-to-date on everything happening in HR land. HR is never going to be a one size fits all process. Needs, capabilities and perks will vary from business to business. Luckily, the industry is rapidly evolving and numerous marketplaces and all-in-one tools such as Bamboo HR, Effortless HR and Zenefits exist at varying price points and with a wide range of offerings. These tools can effectively replace your HR department when utilized strategically (if that’s what you’re looking to do). Other more niche tools such as When I Work, a scheduling and time tracking tool, can assist on the more technical side of human resources. WhenIWork offers guides, templates and checklists to make sure nothing slips through the cracks. It’s incredibly important to note that none of these tools will replace the most important aspect of traditional HR duties: company culture. So make sure that you have protocols in place for building and fostering a culture within your small business. Culture starts with people…which brings us to hiring. Your brand is more than just staying top-of-mind with customers – it’s about positioning your business as a great place to work along the way. When it comes to employer branding, candidates should have a solid grasp of your company’s purpose, mission and values. Be transparent and authentic to attract candidates who can do more than just fill a role, but also align seamlessly with your culture. When your employees are aligned with your culture, they’ll be more engaged in the success of your business and more likely to stick with you for the long haul. There’s nothing more costly for a business than a revolving door of employees. When you put your employer brand front and center – on your website or on social media, for instance – you make easier to attract the right talent at a moment’s notice. Make it simple for candidates to submit their resume on your website, through LinkedIn job postings or on recruiting sites like Indeed, Monster, or CareerBuilder. Highlight your company culture on social media and review sites like GlassDoor where potential applicants are searching for opportunities. 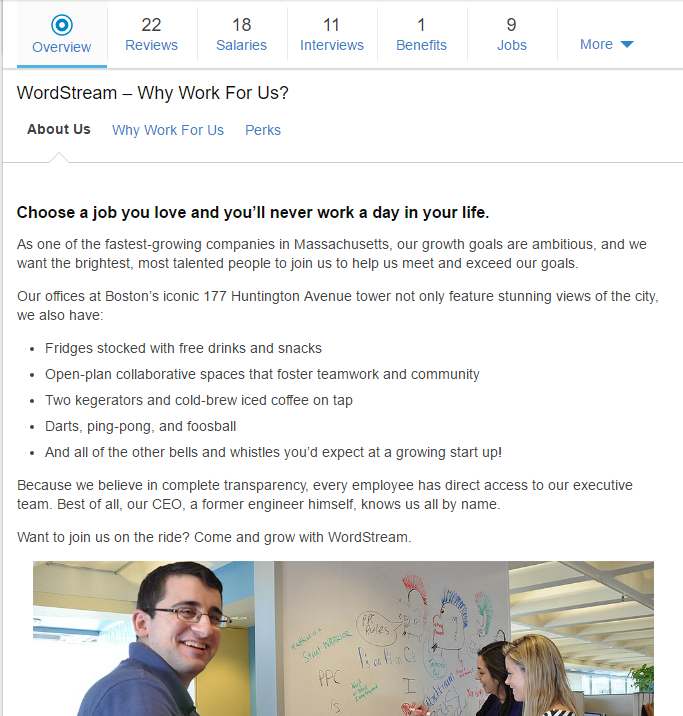 Wordstream puts their company culture on the forefront of their Glassdoor page. Keep your door open to candidates and interview those that are the perfect culture fit – whether you have an opening or not. Ongoing efforts to recruit the right talent will ensure that you have great prospects in the pipeline, making it a breeze to hire that key employee when the occasion arises. Unlike many other aspects of your small business, human resources is not optional. There are laws and regulations in place to protect your employees (and you). So, as HR continues to evolve, it’s vital to educate yourself on changes, requirements and updates in the human resources arena. If you’re not staying on top of trends, you can risk facing legal repercussions – costing you and your business. We recommend bookmarking the Department of Labor site and visiting it regularly. 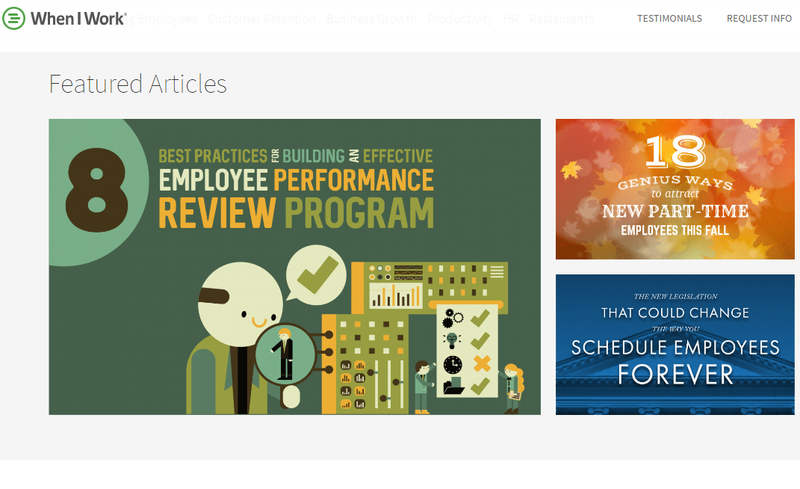 There are also a plethora of interesting HR publications and blogs likes SHRM that feature engaging and educational articles from leading human resources gurus. This is by no means an exhaustive guide to human resources for your small business. Every company and its employee base is different so explore your options, but above all, be sure to stay on top of changes and mandates. Hire the right people and take good care of them to keep yourself and your business on the up & up.